Psychiatrist Andrew Marlowe has a perfectly ordered life. Solitary, perhaps, but full of devotion to his profession and the painting hobby he loves. This order is destroyed when renowned painter Robert Oliver attacks a canvas in th National Gallery of Art and becomes his patient. Desperate to understand the secret that torments this genius, Marlowe embarks on a journey that leads him into the lives of the women closest to Oliver and a tragedy at the heart of French Impressionism. Kostovas masterful new novel travels from American cities to the coast of Normandy; from the late nineteenth century to the late twentieth, from young love to last love. 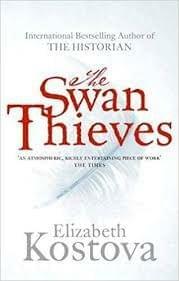 The Swan Thieves is a story of obsession, historys losses, and the power of art to preserve hope.